Published: Nov. 18, 2018 at 08:19 p.m.
Carolina Panthers wide receiver DJ Moore catches the ball along the sideline and somehow keeps both feet in bounds before racing for 82 yards. 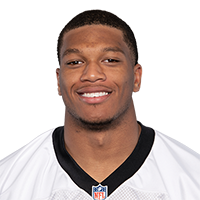 Published: Nov. 18, 2018 at 04:06 p.m.
Carolina Panthers wide receiver DJ Moore runs a perfect route to the corner of the end zone where he jumps into the air and keeps both feet in bounds for an 8-yard touchdown. Carolina Panthers wide receiver DJ Moore rushes for 32 yards. Published: Oct. 28, 2018 at 02:12 p.m.
Carolina Panthers quarterback Cam Newton pitches to wide receiver DJ Moore who picks up 28 yards.